Three of the accused were cleared of all charges, two other employees received a conditional sentence. As part of the sentencing, Heckler & Koch also received a large fine. The verdict has not yet been implemented because the public prosecutor as well as the defence lawyers have appealed. Despite the mixed verdict, the proceedings sent an important signal to the arms industry as well as the German government. The case against Heckler & Koch was especially notable because of a police operation in the town of Iguala on the night of 27 September 2014 when security forces attacked college students at Ayotzinapa. 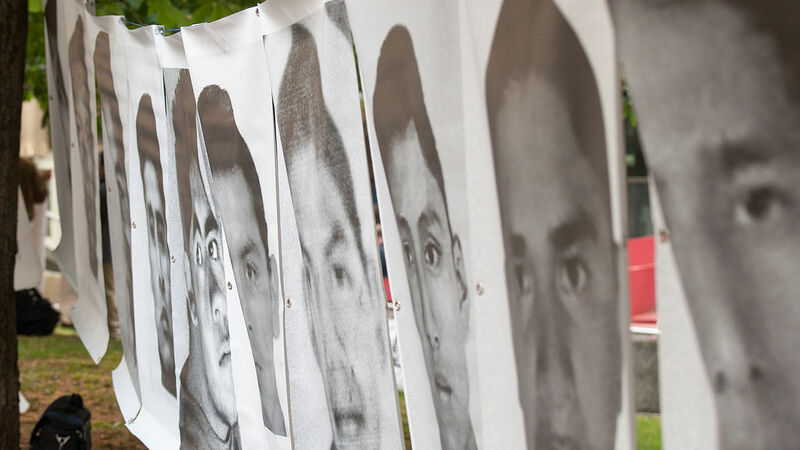 During the police operation, seven students from Ayotzinapa were killed and 43 were forcefully "disappeared" and reportedly handed over to a criminal syndicate. There is still no trace of the students. Many other students were left injured, among them Aldo Gutiérrez Solano who has been in a coma ever since. Mexican investigators found that at least seven policemen used G36 rifles that originated from non-authorized exports. In September 2016, ECCHR requested access to the case files in the Stuttgart proceedings on behalf of Gutiérrez Solano, whose interests are represented by his parents. This marked a first step towards justice for those affected by the export of these German arms. ECCHR's intervention aims to highlight that legal proceedings against arms exporters must concern more than just German trade law. The regional court of Stuttgart rejected the request to access the case files. As a result the proceedings in Stuttgart did not take into account the specific concerns of some of those affected by arms exports in the recipient countries. This decision also dashed hopes of using information from the criminal action in a possible civil claim against Heckler & Koch or in ongoing proceedings against police and government officials in Mexico. Case files may be inspected on request by persons connected with the proceedings, unless doing so would interefere with investigations. In Germany, the Regional Court (Landgericht) is the court below the Higher Regional Court. Regional Courts have criminal and civil chambers. A civil action is a lawsuit brought by an individual against another private individual or entity.